Image courtesy of R.K. and the Iraqi Narratives Project. This story is based on an oral history interview with R. K., from the archives of the Iraqi Narratives Project. The interview was recorded on May 2nd, 2016 in Hamilton, Ontario in the first year this project was founded. Since then, we have documented and archived stories of 13 Iraqis in the diaspora – in Canada and America. We particularly want to document the journey of Iraqis from Iraq to their place of settlement and document how they lived through major political events in the history of Iraq. The blue sky blew up with American aerial bombardment to celebrate my birthday on the night of the 17th of January 1991. My brother’s face yellowed up, my mother held him and cooed. 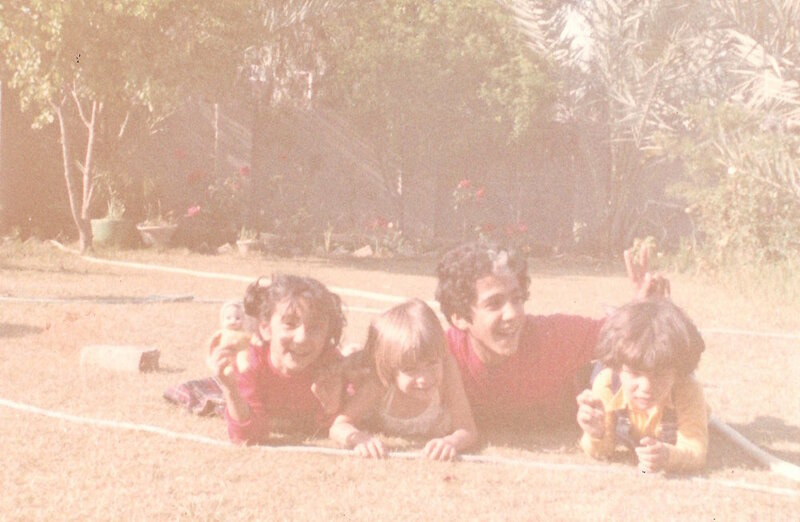 We did not remember to celebrate until my uncle’s family showed up three moons later from out of the sunrise-red smog encompassing Baghdad from the distance. Two cans of Pepsi were distributed into nine glass cups raised to the life I breathed eleven years ago, and more accurately to the life of the five perplexed, ghostly faces that came to tell us the rest of our family was alive. Iraq’s electricity grid was bombed to nihility. My mother made a cake on the choola: a rusty, dusty portable propane gas cooker. She poured the creamy cake mixture into a deep tray and covered it with a shallow, dented one, masterfully flipped it over like dolma and put it down to cook slowly on the small stove. It looked like a contraption you might see in black and white Egyptian movies, or like the kerosene cooker my grandmother insisted on making rice on because of its really low, prudent heat. Even the Pepsi cans were the last that we would see before the sanctions ended all foreign import into the country. In the construction of memory exact dates become indecipherable, but I think it all started in August 1990. I was passed out, wedged between the warm limbs and torsos of my also sleeping brothers on my parent’s white linen sheets. A long silky strand of jet black dyed hair slipped across my itchy cheek as my mother’s closest friend crawled out to the calling of my mother’s voice. We had all slept huddled together that night in my parents’ bed under the safety of the stars. My mom opened the bedroom door and the two women’s bodies morphed into a singled creature attached by the ear and the mouth. “Saddam has invaded Kuwait”, the anxious whispers flowing in the air between them mixed with the sound of the humming birds and the morning breeze. My little brothers whimpered weakly as the buzz of confusion and questions woke us up one by one. The television broadcast stated that Kuwait, the 19th province of Iraq, would be “liberated”. That morning felt far more suffocated than liberated. My dad got stuck abroad because of the travel ban and I could only communicate with him by closing my eyes at night and imagining that he was safe under the same stars. Our neighbours talked of evacuating Baghdad, and my mother finally put us all in the Toyota Corona and drove to her sister-in-law in Tikrit. I imagined the streets of Baghdad empty and quiet; no school kids chasing soccer balls in alleyways, no passengers waiting to get on red double-decker buses, no mother cats fending to feed their kittens under a jasmine bush in somebody’s front yard. I wondered how this huge city could be evacuated and if there were enough airplanes to carry all the people, buildings, houses, trees and the giant sun. My mother stared straight ahead as she drove the interstate highways by herself for the first time. The sun was glowing through the right side windows and she said: “What do you think we should do?” She might have been talking to the three of us sitting upright in the backseat, or to a reflection of my dad that she caught in the afternoon stars, or maybe interrogating the miserable fate that seemed to haunt this land we were cutting across. We stayed in Tikrit for a while but eventually the intimate disruption of displacement bore its weight on us. My father had finally reached Jordan and crossed the land borders back into Iraq. He was a mechanical engineer who specialized in helicopters. He was posted by the government at a military compound in Al-Suwaira, in Kut. It’s a small city in the South, on the west bank of the Tigris River. My mother refused to abandon him, and so we all left Baghdad together. My aunt and her kids came with us in the beginning. Her husband worked at the Ministry of Oil in Baghdad and could not leave his job. In retrospect, that was the beginning of the breaking apart of families, neighbours, and all established social networks we had known all our lives. Luscious palm orchards surrounded the compound, and a busy pool always filled with children was at the center of the forty or so identical mobile homes. It was winter by then; but the sun was always out, and always warm. It did not look like a regular January. It was beautiful and serene and felt like a vacation. Then it happened: the night of the 17th. I woke up to my father’s heartbeat pounding in sync with the areal bombardment and the backdrop of airplanes soaring in a terrified, purple sky. We escaped to a cold, concrete-laden shelter made for airplanes, but now housing families with sleeping children underground. We stayed there for two nights before being carried under the safety of the afternoon stars to a house in the city - outside the military compound, which was targeted by the assault. My mother was comforting my timid, sensitive brother with her right hands as her left arm held on to her own brother in disbelief. Her body tensed as she held both and could not shed a healing tear at the sight of her brother and his family alive. That’s when we celebrated my birthday; the beginning of my life, and the beginning of my awareness of it. Shawk Alani: Femme feminist. Grad student. Drunk on nightmares and Arabic literature. Founding member of the Iraqi Narratives Project.